Stay at Sydney's most laid back hostel complete with great railway carriage rooms next to Central Station. Spoilt for choice in Sydney? Want somewhere different? Railway Square YHA is an original - Australia's only hostel in a railway station where you can stay on the train that's not going anywhere. This unique YHA is in the heart of Sydney's backpacker district around Central. Sleep in one of the funky red train carriages on Central Station's original Platform Zero. Or go for one of the comfy rooms in the converted historic main building. Sydney's grooviest hostel, Railway Square YHA includes a great lounge and cafe, pool and deck area, travel desk, pool table and super fast Internet facilities. 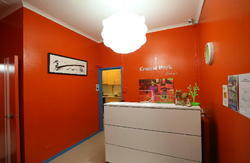 Regular hostel activities including Aboriginal cruises on Sydney Harbour and great value trips to AFL football games. Walk to most of Sydney's major attractions, or shop till you drop and go bar hopping in the city and nearby trendy Surry Hills. Explore Chinatown for great food and Paddy's Markets. AIRPORT/ TRAIN: Take the airport train to Sydney Central Station. Use the Devonshire Street exit from the station and walk through the pedestrian tunnel. At the end of the tunnel take the stairs up to the right to the hostel. Alternatively Airport Shuttlebuses drop off opposite the hostel at Railway Square. BUS: From the Sydney Coach Terminal turn left into Pitt Street and walk one block toward Railway Square. Turn left into Upper Carriage Lane past the front door of the Medina Apartments. Railway Square is the area that is at the junction of George Street, Pitt Street and Lee Street. The hostel is located behind the Medina Apartments, 2 Lee Street.